Everyone in NW Piedmont should expect to see freezing rain overnight. Even Rowan - albeit lighter. 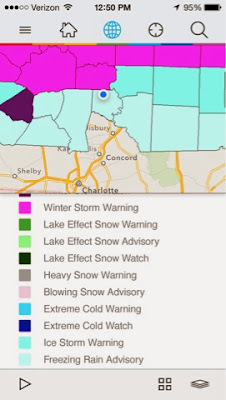 Trivia - what county is not under a winter weather advisory / warning that starts with R and the county seat is Salisbury? Hard to believe when it's 70 - but temps will be headed down by approx 40 degrees tomorrow into Sunday. Prompted NWS to issue Winter Storm Watch for Davie County - freezing rain possible overnight Saturday into Sun A.M. Does not cover Rowan at this time but expect to see a freezing rain advisory at a minimum tomorrow night. night...then change over to rain by Sunday afternoon. * Accumulations...up to a quarter inch of ice. * Temperatures...in the lower 30s. Not sure how much I'll update on this particular event but all signs point to an interesting winter here in the Piedmont of NC.